The public is being given the rare chance to name one of the north-east’s resident dolphins. The male bottlenose in question can be recognised by his distinctive dorsal fin, and is known only as “964” by researchers. 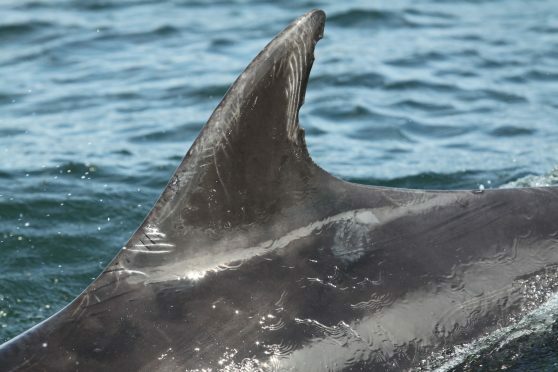 But a Scottish animal charity believes the creature, who is regularly spotted off the coast between Moray and Aberdeen, is deserving of a more interesting title. The competition has been arranged to commemorate the end of the Dolphinwatch drive, which has brought thousands of people to the coast. RSPB Scotland group is marking its conclusion this weekend by offering those devotees of the animals the chance to form a bond with “964” by offering him a better name. In order to gain that opportunity, entrants must correctly guess the dolphin’s birthday when attending spotting sessions today and tomorrow. The dolphin about to be rechristened has been selected from a catalogue maintained by Aberdeen University. Scientists at the institution use the records to monitor the 200 north-east dolphins which have markings or distinctive dorsal fins that enable them to be recognised at close range. In addition to the usual patrols aimed at spotting the creatures, Dolphinwatch will stage family fun events today and tomorrow to mark its final weekend. Volunteers will be on hand at Torry Battery with binoculars and telescopes between 11am and 6pm both days.